Inspire Bingle: Are you stuck? I read recently about a new, hi-tech water fountain. 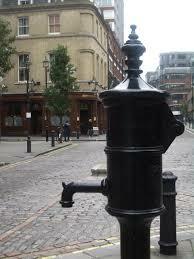 Now, most water fountains you walk up to, find the handle, turn the water on, bend over, and drink, right? This water fountain you simply walk up to, bend over, and drink. It has an infrared sensor or something like that which picks up your presence when you bend over and switches on the water. What’s amazing is how many people look for the handle or button, search all over the fountain for it, and not finding it walk away, still thirsty; thinking, “Somebody needs to fix that water fountain.” All they had to do was bend over and get all the water they wanted. They were so stuck in their usual way of getting water, they couldn’t get their thirst quenched. What “usual way” of doing something are you stuck in? Are you open to trying something different, maybe even more convenient? The fact is many of us choose to stay stuck. So today, do something differently like drive home a different route. And see if God is on that path, too, as you listen to life and make a life, not just a living.